Joined Ravens: Draft 1 (4th), 1996 – Ravens 1st-ever draft choice. A member of the Pro Football Hall of Fame’s class of 2013. Jonathan was enshrined as member 277 into the Pro Football Hall of Fame in his first year of eligibility. Jonathan is a former NFL football player with the Baltimore Ravens. The fourth pick in the 1996 NFL Draft, he was the first selection by the Ravens organization and played his entire career, 12 seasons, in Baltimore. He was an 11-time Pro Bowl selection and received All-Pro honors 6 times. Based on the NFL Network’s list of the 100 greatest players of all time, Jonathan was listed as #72. He was a member of Super Bowl XXXV Champion Team. Ogden announced his retirement on June 12, 2008 and was inducted into the Ravens Ring of Honor on October 26, 2008. Born in Washington, D.C., Jonathan attended St. Albans School where he was an All-American in not only football, but the shot put as well. He played college football at UCLA where he received the Outland Trophy, the Morris Trophy, and was a unanimous first-team All-American. Jonathan also won the 1996 NCAA Indoor Championship in the shot put with a personal best of 19.42 Meters. In 2006, Ogden was inducted to UCLA Athletics Hall of Fame and had his jersey (#79) retired - only the eighth player in Bruins' history to receive that honor. In 2012 Jonathan was induction into the College Hall of Fame Class of 2012. Jonathan currently resides in Las Vegas with his wife, Kema and their two children. Ogden still owns a house in Baltimore and is still very active in the community. 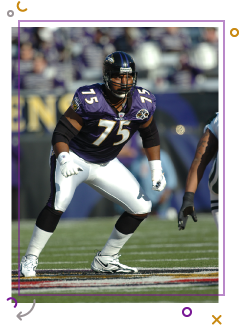 During the football season, Jonathan attends all the Ravens home game interacting with fans and sponsors of the Jonathan Ogden Foundation. Ogden spends his time serving the Jonathan Ogden Foundation in Baltimore and working on his golf game. For me, it’s about trying to maximize every little bit you have. It’s about trying to give it your all. If you strive for perfection, maybe, just maybe, you can become great. Named to his 11th-consecutive Pro Bowl, playing in 11 games (10 starts)…He missed 5 games due to a toe injury suffered in 2006…Helped protect Ravens QBs, allowing them time to complete a franchise-record 341 passes (61.2%) for 3,308 yards and helped open holes, allowing the Ravens to rush for 1,797 yards and 11 TDs. Named to his 10th-consecutive Pro Bowl as a starter on 12/19/06…Earned Sports Illustrated All-Pro, AP 2nd-team All-Pro and NFL.Com All-Pro honors…Started 14 games, missing the final 2 with a toe injury in 2006…Anchored a line that protected Ravens QBs, allowing a franchise record 17 sacks, the 2nd-fewest (Ind. – 15) in the NFL and posted the highest completion percentage (62.6%) in franchise history…Also helped pave the way for the Ravens to rush for 1,637 yards and 11 TDs. Named to his 9th-consecutive Pro Bowl…Started all 16 games at LT and helped protect Ravens QBs, allowing them to complete 59.6% of their passes…The Ravens’ 335 completions were just 3 shy of a franchise mark…Also helped pave the way for the Ravens to rush for 1,605 yards, averaging 3.6 yards per carry. games…Missed the 1st game of the season at Cle., and 3 others in midseason (at Phi., vs. Cle., at NYJ), with a hamstring injury. Earned his 7th-consecutive Pro Bowl…Also earned AP 1st-team All-Pro for the 4th time, Sports Illustrated All-Pro, Pro Football Weekly All-AFC, All-NFL, Football Digest 1st-team All-Pro and The Sporting News All-Pro honors…Started all 16 regular season games and 1 postseason contest and helped Jamal Lewis set a franchise record with 2,066 rushing yards, the 2nd-most rushing yards in NFL history (Eric Dickerson – 2,105 in 1984).games…Missed the 1st game of the season at Cle., and 3 others in midseason (at Phi., vs. Cle., at NYJ), with a hamstring injury. Named to his 6th-consecutive Pro Bowl and garnered NFL Alumni Offensive Lineman of the Year honors…One of only 3 Ravens offensive players (TE Todd Heap and G Bennie Anderson) to start 16 games. Was selected to start in his 5th-consecutive Pro Bowl and earned 2nd-team All-Pro honors, when he started all 16 games. First-team AP All-Pro…Pro Bowl starter for the 4th-straight season…Also earned 1st-team All-Pro from Sports Illustrated, The Sporting News, Football Digest, USA Today and Pro Football Weekly…Started 15 games in the regular season and 4 playoff games, en route to the Ravens’ Super Bowl XXXV Championship. Started every game at LT, earning his 3rd-consecutive Pro Bowl start…Also named 2nd-team All-Pro by AP and earned Football Digest 1st-team All-Pro and Pro Football Weekly All-AFC honors. Pro Bowl starter for 2nd-consecutive season…AP 2nd-team All-Pro…Missed the final 3 games with an ankle injury. Selected to start in his 1st-career Pro Bowl at LT…Won All-Pro honors from Sports Illustrated, The Sporting News, Pro Football Weekly, College & Pro Football Weekly, and Football Digest…Started 16 games at LT.
Capped tremendous rookie season with All-Pro selections by Sports Illustrated and Dallas Morning News while playing his only season at LG…Consensus All-Rookie choice…Named to USA Today’s All-Rookie team (selected by NFL writer Jarrett Bell)…Permitted 1 sack all season and 3 penalties (1 of those on special teams)…Started all 16 games.